Click Give Consent to OneLogin. Note: If you configured and connected Office 365 for OneLogin before the Give Consent functionality was released, consent was given implicitly. If, in this situation, you disconnect the Office 365 connector or change your API user name or password, you will be prompted to give consent when you try to reconnect or try to connect with the new credentials. If no Office 365 applications are open in your browser, you are directed to the Windows Azure Active Directory login page. Enter your Office 365 administrative login (.onmicrosoft.com Global Admin account) and password. A dialogue will prompt you to click Grant Access. 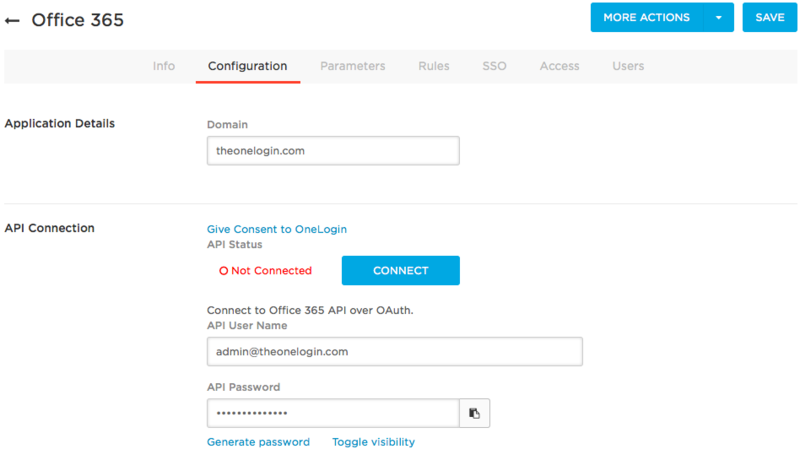 When you have granted access, OneLogin returns you to the Configuration tab. Giving consent enables OneLogin to perform most of the functionality required to manage user access to Office 365, but some PowerShell functions require that OneLogin also pass the API user name and password. Under API User Name and API Password, enter the same .onmicrosoft.com Global Account login and password. Note. Depending on your Office 365 security settings, you may have to reset and re-enter your account owner password every 3 months, as required by Microsoft's security policy. If your configuration is correct, the API status changes to Connected. You can define rules to provision subsets of your OneLogin users into Office 365 Security Groups. Provision to existing Office 365 Security Groups. OneLogin retrieves the existing Office 365 Security Groups from Office 365, and they are available for you to select when you create your rules. When you create your rules, you define a subset of users by filtering on a specific OneLogin user attribute value. Then you define an action that provisions that subset of users to a specific Office 365 Security Group. Create new Office 365 Security Groups and provision users to them. You write a regular expression that creates the new Office 365 Security Group name based on OneLogin attribute values, and then OneLogin provisions users to that group based on those OneLogin attribute values. For examples of both methods, see "Rule Mapping Examples." Note. 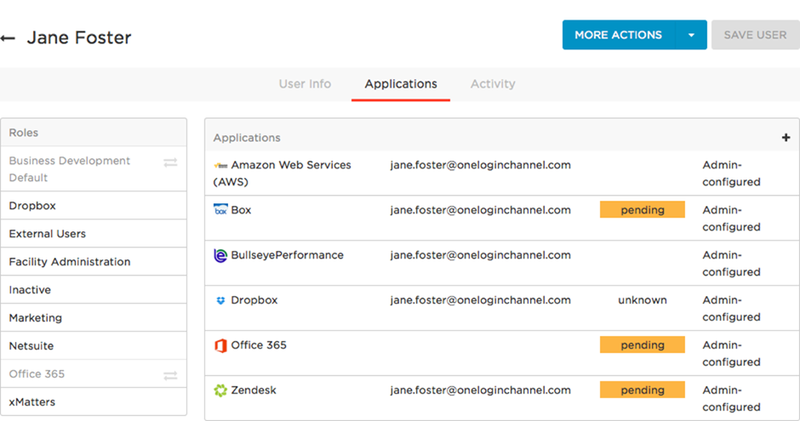 Security Groups provisioning uses Safe Entitlements, a OneLogin feature that prevents provisioning from deleting users that were added directly via Office 365. For more information, see Safe Entitlements. Edit the Groups parameter and select Include in User Provisioning. If you want to create rules that provision users into existing Office 365 Security Groups, you must also go to the Provisioning tab, enable provisioning, click Refresh, and click Save to import your Office 365 groups into the Groups parameter (note that this imports both Security Groups and Distribution Groups). Go to Apps > Company Apps, search for your Office 365 app, and select it. Click New rule to open the New Mapping dialog, where you can set the conditions and actions that determine which users will be provisioned from from OneLogin to specific Office 365 Security Groups. Create a new Office 365 Secuity Group and provision users to it. Provision users to an existing Office 365 Security Group. To add another provisioning rule, return to the Rules tab and click New rule. The order in which rules are applied matters and can impact provisioning results. Drag and drop the rule rows to put them in the order that produces correct results. 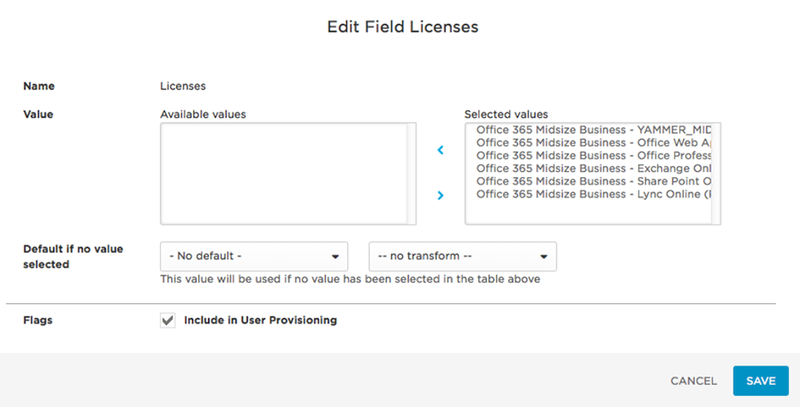 You can define rules to provision subsets of your OneLogin users into Office 365 Distribution Groups. Note. OneLogin does not support provisioning to Distribution Lists, because Distribution Lists can include external users (users not in included in your OneLogin Cloud Directory). If you have Distribution Lists that consist entirely of internal users, you an convert these lists into Distribution Groups and provision to them from OneLogin. Provision to existing Office 365 Distribution Groups. OneLogin retrieves the existing Office 365 Distribution Groups from Office 365, and they are available for you to select when you create your rules. When you create your rules, you define a subset of users by filtering on a specific OneLogin user attribute value. Then you define an action that provisions that subset of users to a specific Office 365 Distribution Group. Create new Office 365 Distribution Groups and provision users to them. You write a regular expression that creates the new Office 365 Distribution Group name based on OneLogin attribute values, and then OneLogin provisions users to that group based on those OneLogin attribute values. Note. Distribution Groups provisioning uses Safe Entitlements, a OneLogin feature that prevents provisioning from deleting users that were added directly via Office 365. For more information, see Safe Entitlements. 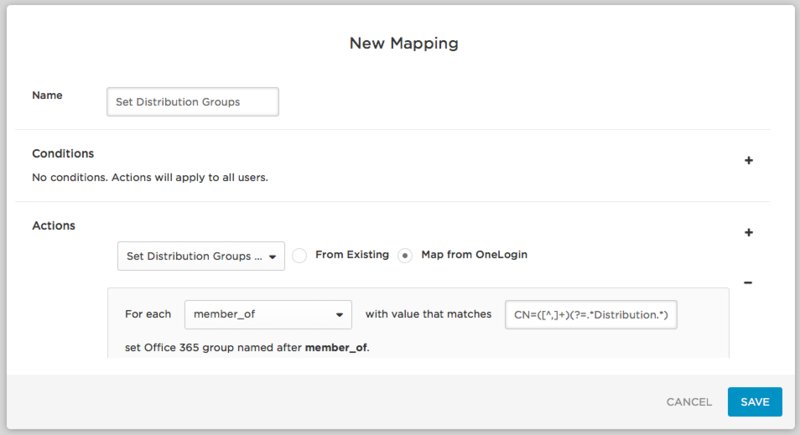 Edit the Distribution Groups parameter and select Include in User Provisioning. If you want to create rules that provision users into existing Office 365 Distribution Groups, you must also go to the Provisioning tab, enable provisioning, click Refresh, and click Save to import your Office 365 Distribution Groups into the Distribution Groups parameter. 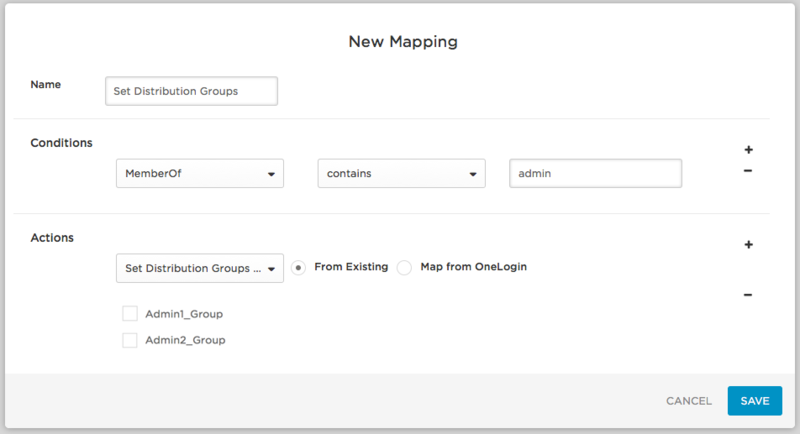 Click New rule to open the New Mapping dialog, where you can set the conditions and actions that determine which users will be provisioned from from OneLogin to specific Office 365 Distribution Groups. Provision users to an existing Office 365 Distribution Group. For use cases like this one in which you are provisioning users to new Office 365 Security Groups, no conditions need to be set. All settings are configured in the Actions area. In the first drop-down, select Set Groups in Office 365 App Name to provision OneLogin users to Security Groups in Office 365. Select the Map from OneLogin option to provision users to the new Office 365 Security Group created based on information in OneLogin. Select a For each value of memberOf to provision users to Office 365 based on their member_of user attribute value. To identify the AD/LDAP security groups that will be used to create groups in Office 365 and provision users to them, provide a regular expression (regex) in the adjacent field. Provisioning will parse through AD/LDAP security group data and apply the regex. For each matching value, a group will be created in Office 365. Any users who are members of a matching AD/LDAP security group in OneLogin will be provisioned to the newly created group in Office 365. Use the two adjacent fields to write a condition to select the AD/LDAP Security Groups that contain the users that you want to provision to Office 365. In the first drop-down, select Set Groups in Office 365 App Name to provision users in the selected AD/LDAP Security Groups. Select the From Existing option to provision users to an existing Office 365 Security Group. Select the existing Office 365 Security Group to which you want to provision the users who are members of the selected AD/LDAP Security Group. For use cases like this one in which you are provisioning users to new Office 365 Distribution Groups, no conditions need to be set. All settings are configured in the Actions area. In the first drop-down, select Set Distribution Groups in Office 365 App Name to provision OneLogin users to Distribution Groups in Office 365. 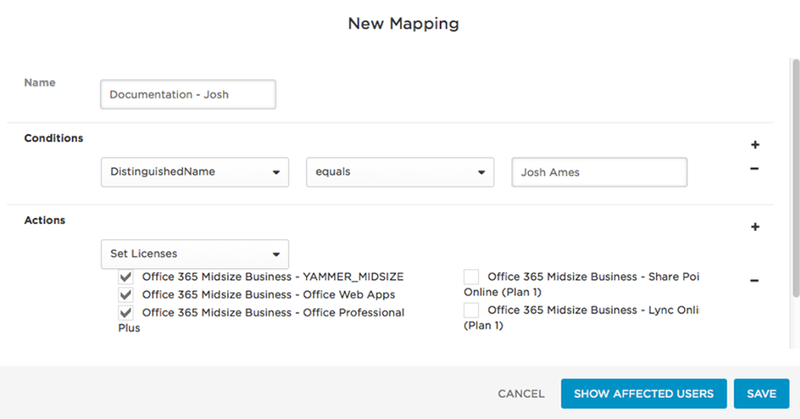 Select the Map from OneLogin option to provision users to the new Office 365 Distribution Group created based on information in OneLogin. The OneLogin member_of user attribute value is populated by Active Directory (AD) and reflects the user's membership in an AD/LDAP Security or Distribution group. To identify the AD/LDAP Distribution groups that will be used to create Distribution Groups in Office 365 and provision users to them, provide a regular expression (regex) in the adjacent field. Provisioning will parse through AD/LDAP Security and Distribution data and apply the regex. For each matching value, a Distribution Group will be created in Office 365. Any users who are members of a matching AD/LDAP Distribution group in OneLogin will be provisioned to the newly created Distribution Group in Office 365. In the first drop-down, select MemberOf to provision users based on their member_of user attribute value. The OneLogin member_of attribute value is populated by AD and reflects the user's membership in an AD/LDAP Distribution Group. Use the two adjacent fields to write a condition to select the AD/LDAP Distribution Groups that contain the users that you want to provision to Office 365. In the first drop-down, select Set Distribution Groups in Office 365 App Name to provision users in the selected AD/LDAP Distribution Groups. Select the From Existing option to provision users to an existing Office 365 Distribution Group. Select the existing Office 365 Distribution Group to which you want to provision the users who are members of the selected AD/LDAP Distribution Group.